Unfortunately the "AARP $10,000 Find Your Harmony Sweepstakes - 45+" offer is no longer available. Practicing yoga, meditating, and even drinking tea are some of the activities that are helping people live longer, healthier lives. Do something wonderful for yourself when you explore activities to help you thrive in mind and body and you could win $10,000 from AARP. 40 million Americans over the age of 50 enjoy the benefits of subscribing to AARP Magazine. Beyond illuminating content that's relevant to their lives, members get exclusive discounts on travel, insurance, and even groceries. Subscribers also save on their prescriptions with their pricing comparison program and members-only deals on drug coverage. AARP is devoted to making your journey to retirement easier by aiding you with financial advice and opportunities for savings. The AARP Health Newsletter is released only once monthly so that it can deliver the very best information for retirees and those aging gracefully towards retirement. It covers important topics like which questions to ask your doctor, which low-impact exercises to perform for improved musculature, and which supplements are most important as the golden years approach. 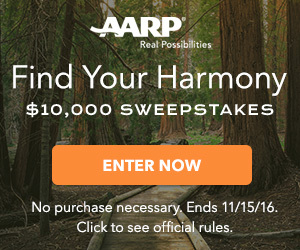 It's easy to enter the Find Your Harmony Sweepstakes by registering on the AARP website. Earn bonus entries and get entered in the Instant Win Game when you answer trivia questions about their themes, Nourish Your Body, Train Your Brain, and Love Your Life. You'll know immediately if you've won 1 of 10 $25 Visa gift cards after playing the game. AARP is giving away a $10,000 Grand Prize to help one winner find their bliss. If you're 45 years or older, enter the AARP Find Your Harmony Sweepstakes to win $10,000 in cash for your journey to a better self. One winner will be randomly chosen to win the $10,000 grand prize after the contest closes on November 15th, 2016.